CFZ-CANADA: Could Bigfoot Be The Killer/Kidnapper on the "Highway of Tears" in British Columbia? Could Bigfoot Be The Killer/Kidnapper on the "Highway of Tears" in British Columbia? I have noticed many negative comments about this article, some are saying that the article is disrespectful to the families and the missing and killed woman. 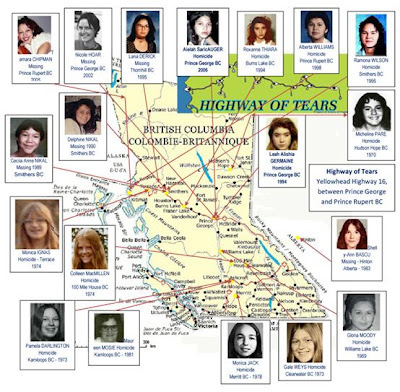 In the article I wanted to bring to light to the public the horrific incidents that have been occurring in Highway 16 and other nearby highways in the BC area of Canada. In no way was my intent to make any one upset specially the families of these women. The connection to Bigfoot been the killer kidnapper of these woman to me is also absurd, but when events occur that are part of a larger and unresolved mystery, people can at times try to find answers to the possible cause of such events in other theories. I just found very interesting the many reports of BF sightings on or close to Highway 16 in BC Canada. The Canadian Royal Police believe it’s the work of one or more serial killer, which I even believe is more plausible. I want to apologize if I upset anyone and hope that these families get the closure they need and whoever or whatever is committing these crimes is stopped. So many strange disappearances have occured on a stretch of highway that covers 837 miles in the province of British Columbia Canada, mostly involving women or children. Few roads on earth are more dramatically breathtaking than Canada’s Highway 16. The lonely highway stretches east-west through British Columbia, winding its way through snow peaks, bustling mill towns, and a remote and lonely wilderness that feels as if it has been lost in time. No one knows what or who exactly is to blame for the missing and dead. Canadian Mounty police in some cases believe it is the work of a serial killer, yet more than 3 decades have passed without any luck. Even a special task force has been formed and a Canadian government inquiry was opened regarding why so many women ranging in age from children to adults have either been killed or have never been found. Recently, in May of 2011, another young woman disappeared never to be seen again. 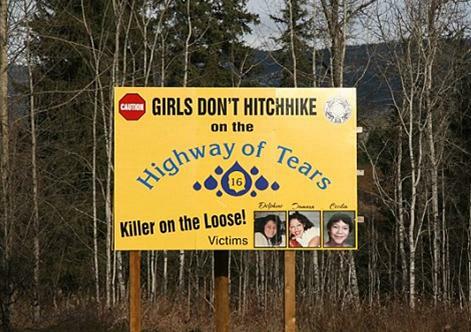 A 20-year-old female vanished near what has come to be known as the Highway of Tears. The young girl was last seen at 3 a.m. on the night of May 27, 2011 at Hogsback Lake, a very popular camping and party spot. The camp site is located about 15 miles south of the young woman’s small town of Vanderhoof. A few days after the young lady went missing police found her belongings, tent, and pickup truck at the campsite, but no sign of the young woman was ever found and search parties came up empty handed after several days. 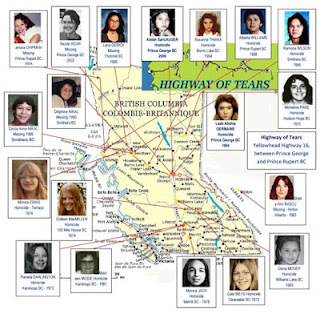 The young girls fate appears to be the latest in a more than three-decade-long period during which numerous women have been killed or gone missing near three of B.C.’s northern highways, most prominently Highway 16. Canada is a country where murder is rare (610 homicides in 2009, compared to the United States’ 13,636), so it is interesting that it would have so many murders and missing persons. While the Royal Canadian Mounted Police say the number of missing and dead totals 18, aboriginal leaders in the area say the real number is much higher, around 43. Royal Canadian Mounted Police believe that Highway 16 is possibly the trolling ground of a serial killer (or killers). Others put the blame on truck drivers who regularly haul timber and other resources through the remote communities. According to the RCMP statistics in 2011, 10 of the 18 apparent victims lived in remote aboriginal communities and use hitchhiking as a possible means of travel. In 2011 Chris Freimond, a spokesperson for the Canadian government-funded Missing Women Commission of Inquiry stated; “Whether it is one person or whether it is a few individuals, it is really open to speculation. “It could just be that some sick people up there realize that women hitchhiking alone are easy pickings. Towns are far apart and there are long stretches of road. Sometimes the radio fades out and there is no cell service. There are logging roads off every highway. If someone has bad intentions, you will find a victim. Someone can go off and drive for an hour and throw a body into a ravine and they would never be found.” The commission held informal hearings about the disappearances and murders that happened during the month of May of 2011. As of June of 2012 the ongoing and in depth RCMP [Royal Canadian Mounted Police] investigation has not created any new leads on the cases of the missing and murdered woman, except for a report from April of 2011, when police distributed a sketch of an elderly man who attempted to kidnap a 20-year-old woman at a location near Highway 16, but the man was never found. The first documented case of a missing or murdered victim was of a young woman 27 years of age in 1969. Some residents of the many communities near the so called “Highway of Tears” worry that the same may happen to other woman and have taken upon themselves to post warning signs for women to be cautious when traveling highway 16. On Feb. 5, 2002 a local man from Vancouver name Robert Pickton was arrested and charged as the prime suspect of 27 murders which include some of the murders of this mystery. While in jail Pickton admitted that he had killed over 49 women. It is interesting that even after his capture the murders and missing women reports continued and still remain unresolved. Many hope that whoever or whatever is doing things is captured or stopped. I also found an interesting article written in the summer of 2000 about Sasquatches in British Columbia by Dr. John Bindernagel, which talked about a few of the reports of over 200 possible sightings of Bigfoots. So it is not surprising that many would try to make a connection to Bigfoot and this mystery with so many reports of Bigfoot sightings since the early 70’s in the vicinity of highway 16 and other highways in British Columbia. The Canadian Royal Mounted Police finds Bigfoot as the answers to the unsolved cases of these victims as ridiculous. One thing for sure, with so many unanswered questions some people are starting to believe that something else is responsible for many of the missing or murdered girls. Unfortunately, due to the ongoing investigations, the details of events of the missing and causes of death and have not been made public. The Canadian police still believe it is the work of one or more serial killer. Damian Bravo is a Contributing writer for bigfootevidence.blogspot.com and www.sasquatchlives.com He lives in Tampa, Florida. We thank him for the use of this interesting article.